In the past few months, as series of protests have broken out in France against the government of Emmanuel Macron. Sparked by a rise in fuel prices – part of a Macron government proposal to cut the country’s carbon footprint – the unrest saw demonstrations across the country, though the most high-profile of them were in the capital Paris. The demonstrators, for the most part, wore the reflective yellow vests all French drivers are required to have in their car should it break down. The mouvement des gilets jaunes or “yellow vests movement” has become the face of French protests against austerity and attempts to reform some of legislature. There have been many compelling news images of the protests since they began in November, the garish yellow vests standing out against the overcast skies and the stately stone of Parisian apartment buildings. 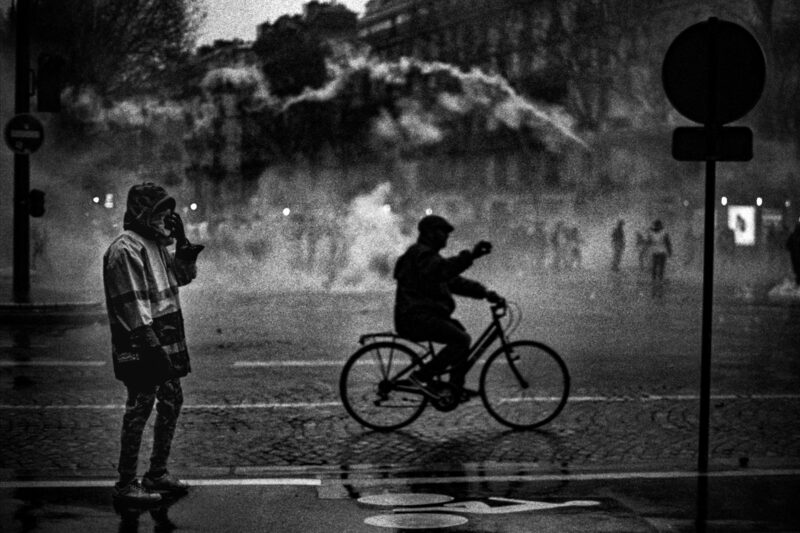 But young French photographer Clement Marion has done something different – he has shot a day of protests using a Minolta SRT-100X camera and black-and-white film. Kosmo Foto saw these images posted on a Facebook photography group. Quite simply, they are stunning. Marion’s heavy treatment has boosted contrast and grain; not the kind of thing you’d do for wedding shots, but perfectly suited to these smoke-shrouded winter streets. They remind me of a series of books about World War II my family had when I was a kid. Some of these gloomy, grainy images look a hangover from an even darker era in European politics. I am 22, I studied photography for two years and during that time discovered film. I live in Marseille, in the south of the France. Actually I am working to earn money to pay the third year of photography school in Toulouse. 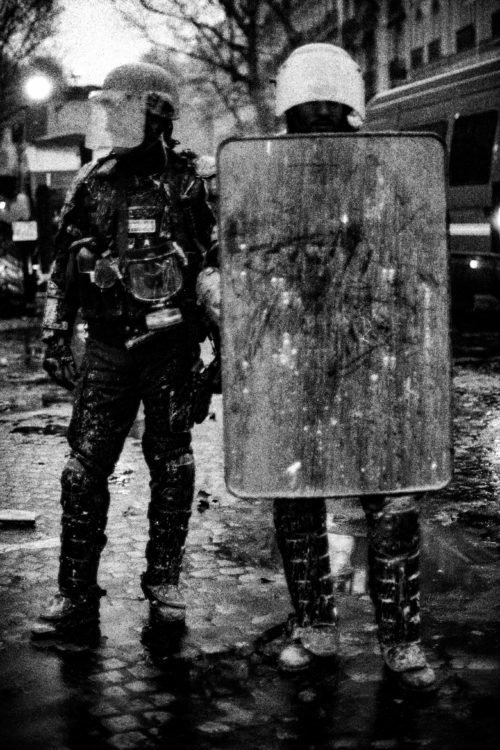 What took you to Paris to shoot the protests? I had a stopover in Paris for two days, I was coming back from Germany. A friend offered me a place to stay, and he had already made a small series on the yellow vests, during the two previous acts. He suggested I join him for the protests the next day. 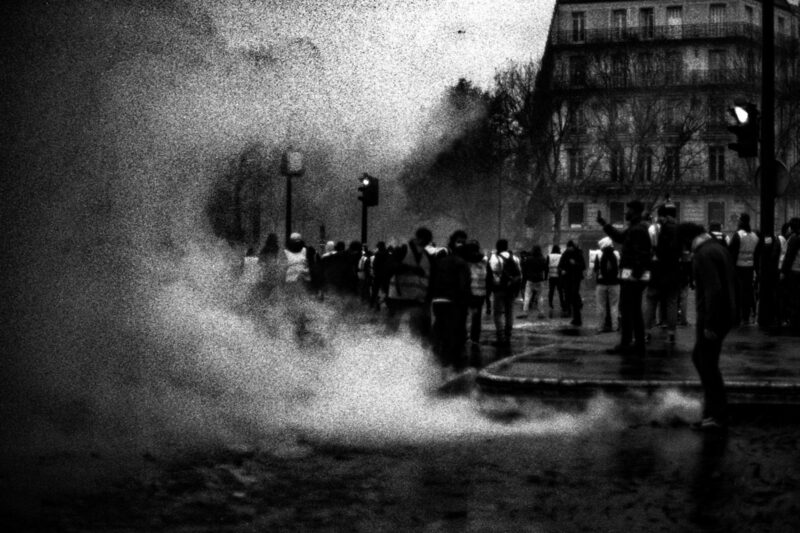 So we spent a few hours in the afternoon in Paris, among the protesters and CRS. Describe what happened on the day. My friend and I are not used to demonstrations, it was the first time for me. 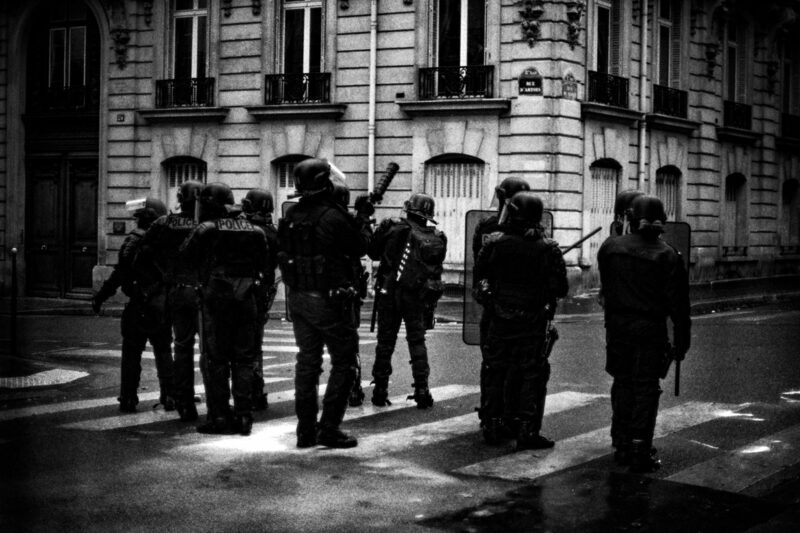 At first, when a horde of CRS charges you, the adrenaline spreads in you like the gas in the street. And then you learn to position yourself between the two parts of the crowd, to be as safe as possible, while having a good field of vision. We could not enter the non-violence area because I was wearing a helmet. So we stayed in Saint Augustin Square, and on the Malesherbes Boulevard. On the day, that was where most of the clashes took place. After four hours of gas, screaming and moving crowds, we walked back, exhausted, almost all the subway stations had closed in the meantime. Is this the first time you’ve shot something like this? Yes, definitely. And it’s hard to accept the fact that during the shoot, looking through the camera’s viewfinder for a moment, anything can fall on you and hurt you. It’s a bit too stressful compared to the photography I usually do. But it was a very good experience; humanely, artistically, and technically speaking. Why did you use the Minolta? Because it’s my favourite. Robust, not very expensive, refine, ergonomic. It is a good value for money. I started with a friend’s SR-T 101B model, and my dad gave me his SR-T 100. In my photos I do not necessarily seek a very fine definition of detail in the image, so it is a device that suits me. I also use a Minox, I like it a lot for discrete shots, and a Rolleicord, for more posed and thoughtful images. For this series, I used the 50mm 1.4 Rokkor. It was new for me so I tested it. 50mm is a very good focal length. Also I use sometimes a 28mm 2.8 lens. Why did you shoot it on black-and-white and not colour? I can assure the chain of production of images in my room, from the beginning to the end, development, and printing included. It’s harder in colour. The whole process is important, and I do not want to let it be done by a lab, or anyone other than me. And then I tend to prefer very drab colours, or black and white, in any case. I assume that for this topic, the yellow would have been important. But I had only Ilford HP5+ and Rollei RPX 400 in my bag, and they are both black and white. How did you treat the negs to achieve this look? Since a few months, and during the trip to Germany and Holland, I’m looking for texture on my images, grain, but also surface effects on films, deterioration. Here, I pushed the development with Rodinal and a development time much too long, voluntarily. It is risky, if you do not want to lose the negatives, but I often had a good surprise. I learned to do classic development in the right way, and then broke the rules. And I intend to continue in deterioration. It’s been almost three years now. Starting from the day I tried shooting film in photography school. I never used digital for any of my personal work after that! It’s something more manual, I am much closer to my image, than through a screen. Which does not prevent me from digitising my negatives and print sometimes! What kind of things do you usually shoot? I shoot the kind of things that appear in my field of daily view. Everything can be a good photo. Most of the time, I like to travel to provoke photography, to meet the moment. And I usually do a series of photographs. This is for me is the best way to show somethings: using series, and not one unique image. What image from the ones you sent sums up the day for you? What are you planning to do with the images? The future will tell! Maybe some exhibitions in France. I like to believe that I testify to an event in the history of France, thanks to my photographs. You can see more of Clement Marion’s images on his Instagram. Previous articleIs Brie Larson about to cause the next film camera price spike?